This Cherry Cheesecake dip, done in minutes, and served up on a platter with your Nilla wafers or added to mini mason jars for personal serving sizes is a perfect choice this season. You won’t have to spend hours in the kitchen for this quick and easy 3 ingredient, no bake option for holiday dessert this year! Cherry dip not only looks beautiful on your holiday table but is a sweet treat that your entire family will love. Scroll down for How to Make Cherry Cheesecake Dip instructions! Of course not everyone loves cherries, so this Strawberry Pretzel dessert is a perfect alternative and one serving recipe that will make a beautiful and tasty party platter. Personally I find the quicker the dessert often the better it tastes. You can make and serve quickly, making sure its fresh. Don’t be afraid to add additional fun ingredients like chocolate chips or sprinkles. While this is a group dessert, you can easily make this in mini jars for personal serving! It’s so easy to make this no bake dessert recipe and it starts here. Add cream cheese to a mixing bowl and beat for 30 seconds. You can always tell its gonna be yum with creamy and delicious cream cheese in the recipe. Now add your fluffy marshmallow cream . Beat both ingredients on medium high speed until mixed well. I love any excuse to use my stand mixer, but a hand mixer works just as well here. Spoon your dip into a favorite serving dish. Now ready to make it cherry?? 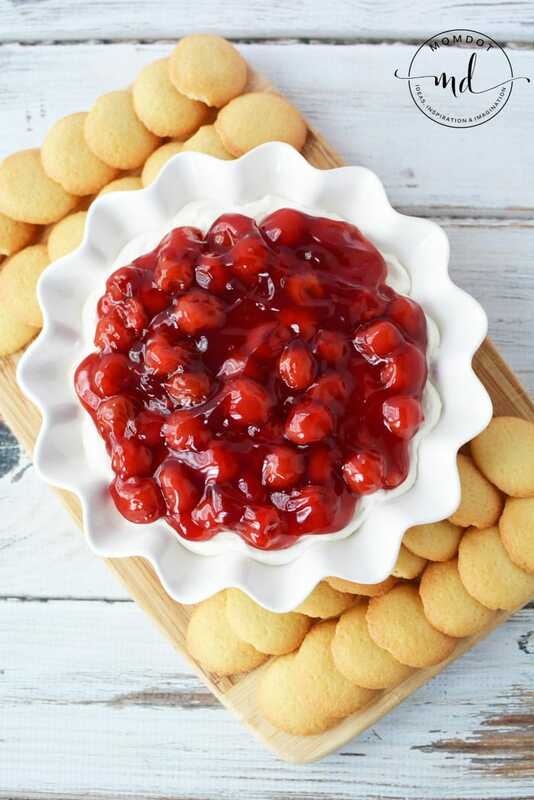 Top with a pre-made cherry pie filling and serve with graham crackers or vanilla wafers. You can choose pretty much any serving cookie for this but I think there is something special about using graham crackers with the cherries, like a mini pie! Make cooking, baking and creating for your family easier with the right kitchen supplies! My picks for getting moving in the kitchen. Stand Mixer – A stand mixer is a great option for every family. Its so easy to pour and the mixer does all the work! Everyone loves a KitchenAid because they have a solid reputation and beautiful colors , but my Kenmore Mixer works just as well. I do not think you can wrong with picking a mixer and the kids love using it as well. Mixing Bowls – I think we all grab mixing bowls randomly at Walmart, but buying quality mixing bowls for your culinary kitchen fun is worth it. Get some with color coded sizes or even weights to keep them from tipping over. Mason Jars – You can make an instant one person dessert serving (especially for no bake recipes like this) and forget going through all the bowls in your house by serving in mason jars . I keep several sizes on hand for not only desserts but also creating custom dips, sauces, jellies, salsa, and dressings. Need another fruity idea? Click below for Strawberry Pretzel Jars, a mini personal serving dessert that will look gorgeous at any party and travels home with your friends and family! This site is my inhalation, very good style and Perfect articles.